When I was in seventh grade, I wrote a pretty impassioned essay for my English class about how Valentine's Day was a corporate holiday maintained by companies like Hallmark and Hershey's to provide a predictable source of revenue year after year. Pretty original and incendiary stuff for a middle schooler, I know. I remember my classmates glaring at me as I read my essay out loud, as they clutched the mandatory valentines and candies that we had been forced to exchange earlier that day. Shut up Michelle, I could hear them think. What's wrong with an excuse for free candy? In the case of this cake, it was a double whammy — built and baked for both the upcoming Valentine's day holiday and during a special occasion. The special occasion was of course, the fact that a rare snowstorm had hit Portland, delivering us a good seven inches of snow. I know that doesn't sound like a whole lot, but believe me, for Portland, it is. Snow is such a rare occasion that the city is rumored to only own 2 snow plows for the entire city! As a result, absolutely everything gets cancelled and shut down. 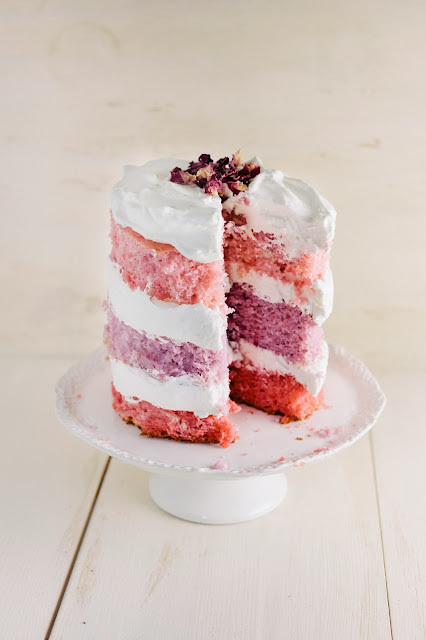 Each cake layer, tinted with varying shades of pink and lavender, is flavored with rose water and layered between a healthy portion of vanilla whipped cream. I know that the cake itself looks a little bit rustic and rough around the edges, but the sides of the cake are left unfrosted to really let the colors shine. This is the cake that I presented to my Valentine, and hopefully it'll be the one you present yours as well. Happy Valentine's Day! Rose water is available online, specialty culinary stores like Sur La Table or Williams Sonoma, or the international and/or Middle Eastern section of fancy supermarkets. Specifically, I used Nielsen-Massey's rose water — I highly recommend any of their products. You will need at least two 6-inch cake pans for this cake; make sure the sides of the cake pans are at least 3 inches high, because this cake rises a lot. I used this Ateco cake pan with a removable bottom — it makes flipping the cakes out a lot easier, though it sometimes does have a tendency to leak batter. Alternatively, if you have shallower pans, you can just divide the batter into quarters and create 4 layers. I ended up using a 6-inch cake ring to cut off the edges of my cake — doing so gives the cake its raw, colorful appearance. 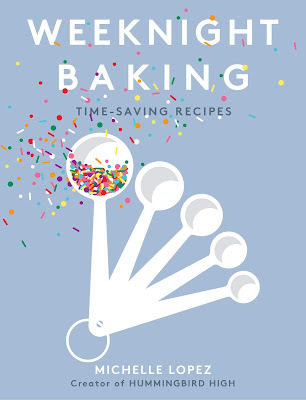 If you don't want to invest in a cake ring, you can use a serrated knife to cut off the edges. OR, game changer: you can also leave the edges uncut for a different look! However, the colors won't pop as much since the outsides of the cake all tend to be a baked, brownish color. To combat this, you can use wayyyyy more food coloring than I did to make sure the outside of the cakes actually show color — something like 2-3 tablespoons of food coloring per tin. I tend not to go this route because I don't like too many artificial ingredients in my baked goods. This cake is best the day its made, so be sure to serve it after immediately cutting and layering it. Its exposed layers and whipped cream filling do NOT hold up well overnight, even in the fridge. Preheat the oven to 350 (F) and center a rack in the oven to the middle position. Prepare three 6-inch cake pans by greasing the sides and lining the bottom of each tin with parchment paper. In a medium bowl, whisk together 1 3/4 cups cake flour, 1 1/2 teaspoons baking powder and 1/4 teaspoon kosher salt until combined. Set aside. In the bowl of a freestanding electric mixer fitted with a paddle attachment, combine 1/2 cup unsalted butter and 3/4 cup granulated sugar. Beat together until the mixture is light and fluffy, at least 5 minutes. While the butter and sugar is creaming, combine 4 large egg whites, 1/2 cup whole milk and 1 tablespoon rose water in a liquid measuring cup. Whisk together until well combined. With the mixer on its lowest speed, add the dry ingredients (from the 2nd step) to the butter and sugar in three parts, alternating with the liquid ingredients (from the 4th step) in 2 parts. Continue mixing until just combined — it's okay to have one or two flour streaks left in the mixture, and at this point, it's better to keep the batter undermixed. Once the batter is ready, divide evenly into three medium bowls. Add a couple drops of food coloring to each bowl, and use a rubber spatula to stir and incorporate the food coloring into the batter until the batter is one uniform color. Transfer the different colored batters into its own separate cake pan and transfer to the oven to bake until light golden and just firm, about 18 to 23 minutes. When ready, a skewer inserted into the center of each cake should come out clean. Transfer the pans to a wire rack to cool for 15 minutes, before inverting the layers out of the pans to cool completely before cutting and frosting. When the cakes are completely cooled and ready to be cut, make the whipped cream filling. Combine 1 1/2 cups heavy whipping cream, 1/2 cup confectioner's sugar and 1 teaspoon vanilla extract in a freestanding electric mixer fitted with a whisk attachment. Beat on medium-high speed until soft peaks form, taking care not to overwhisk or you'll end up with butter. Set aside, but make sure you use the cream within 15 minutes of making. 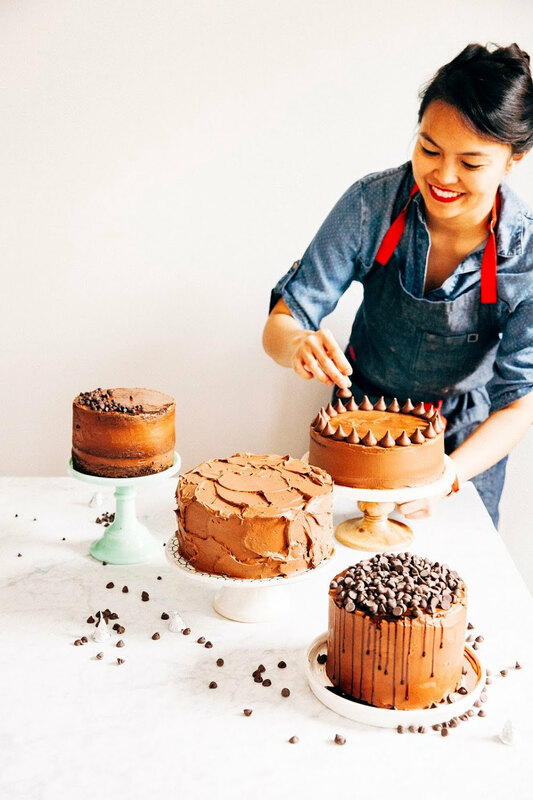 Use a 6-inch cake ring or a serrated knife to carefully level and cut the edges and sides off each cake. 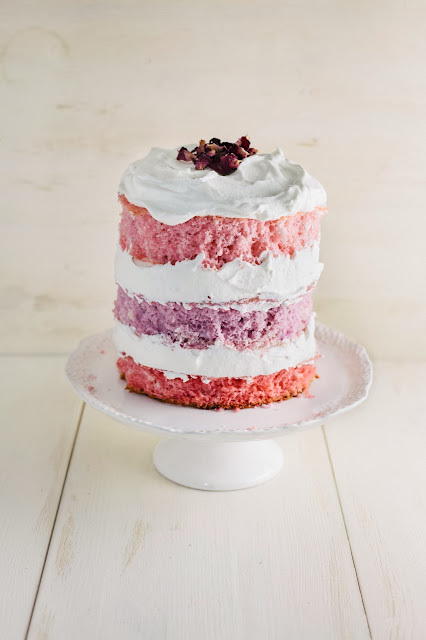 Place your base layer onto a cake plate or cake stand, and use a rubber spatula to transfer about 1 cups worth of whipped cream to the top of the cake. 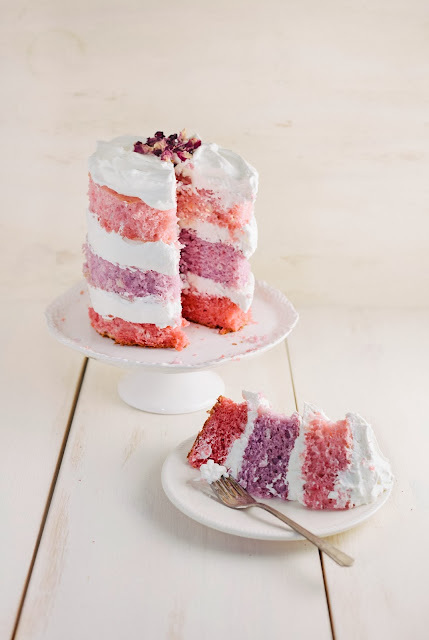 Use an offset spatula to carefully distribute the whipped cream around the top of the cake, creating an even layer. Gently nestle the next layer on top of the whipped cream, and repeat until all cake layers are use, topping the final layer with the remaining whipped cream. Serve immediately. Waht a beautiful cake. It looks delicious and perfect for Valentines day. 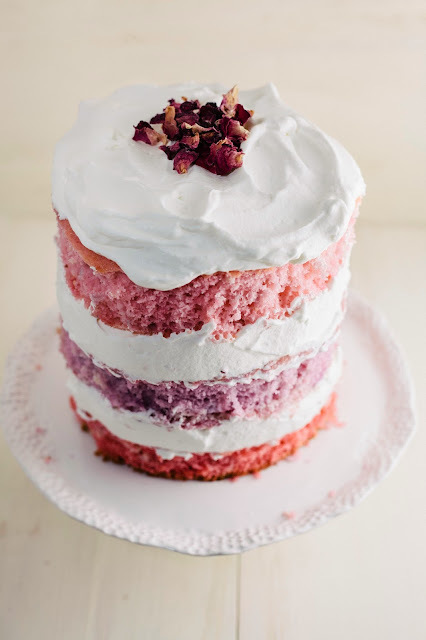 Normally I'm a bit non-plussed by ombre cakes but this looks beautiful! I love the subtle colour palette you've used and I just want to dive in with a fork. Love this so much. I'm absolutely in love with this cake, Michelle! It just looks like the most heavenly texture -- and the frosting is impeccable. Eeeeeeee. I love Valentine's Day too if it produces gems like these. Love! 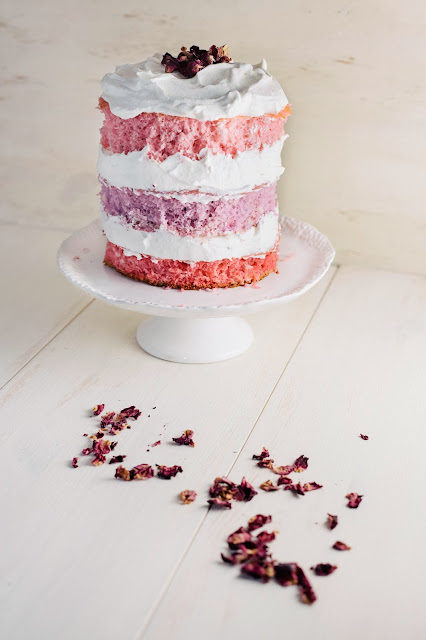 Such a pretty, delicate looking cake. Great choice of colours, it reminds me of flowers in bloom in the spring time. Lovely! This is incredibly beautiful! It looks moist and fluffy, and I want to reach through my computer to dig in! Well done. Michelle, I laughed picturing your seventh grade self making that speech. It sounded just like me. Only difference, I never altered my opinion -- still bah humbugging Hallmark Holidays! Pretty cake for the occasion, though, I must say.